The ATHOS range of commercial vehicle tyres includes a comprehensive series of of sizes and tread patterns. The ATHOS premium brand has the right commercial vehicle tyre for every application – whether it's for the front or rear axle, a light truck, a construction site vehicle or a bus. ATHOS truck tyres have many impressive features, not least their performance, appearance, casing quality and unbeatable value for money. This is a tyre manufacturer that always operates in line with its basic philosophy: 100% quality – without compromise, powered by Germany. In terms of their technical details, ATHOS has several USPs which make them a premium tyre for commercial vehicles. The truck tyre of the Hämmerling Group is the only product in Germany and Europe of this type to be inspected and certified by TÜV. 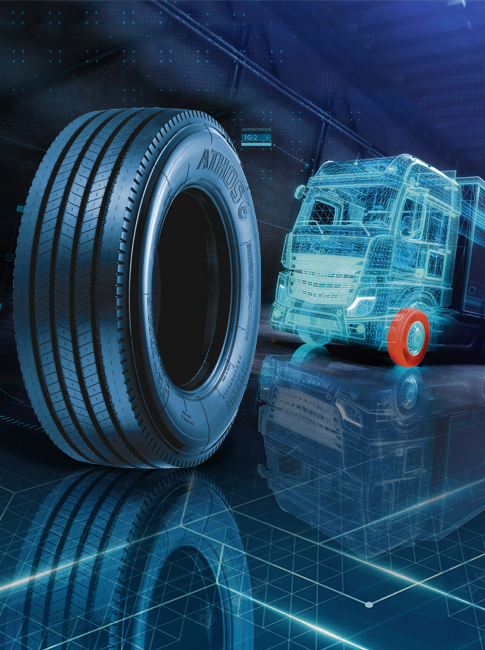 Success has proved the tyre manufacturer right – many different OEMs are already using ATHOS truck tyres in vehicle manufacture. Why not make up your own mind and look for an ATHOS partner in your area – or become one yourself!